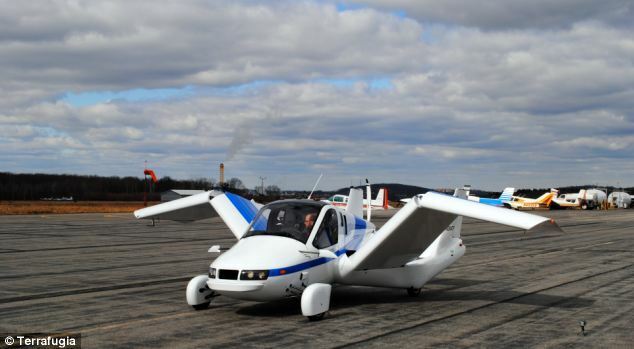 As the firm gears up to finally release its flying car next year, engineers from Massachusetts-based Terrafugia are set to reveal how the Transition was created. During a webinar, scheduled to take place later today, Mark Corriere and Nicholas Tucker will discuss the design and development process, as well as talk about the challenges involved in building an aircraft that can also be driven on land. The Transition took part in two 20-minute flight demonstrations in July and is still going through tests needed to earn it federal certification. The online event is being hosted by Nasa and will begin at 1pm EST (6pm GMT). The Transition can reach speeds of around 70 miles per hour on the road and 115 in the air. 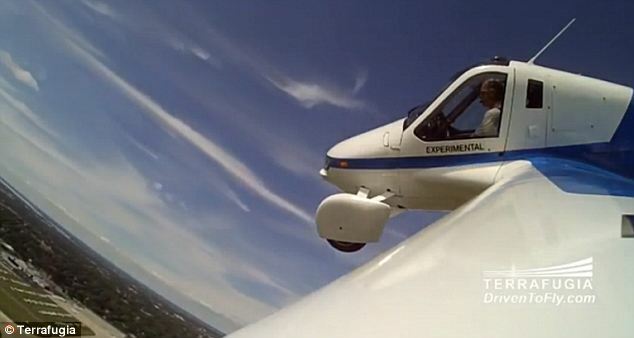 It flies using a 23-gallon tank of automotive fuel and burns 5 gallons per hour in the air. 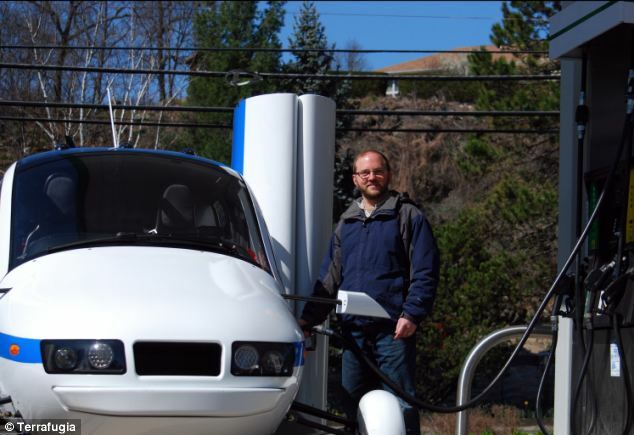 On the ground, it gets 35 miles per gallon. The Transition has rear-wheel drive when on the road. It comes with two passenger airbags, and a full-vehicle parachute. The flying car is 2m tall, 2.3m wide and 6m long with a wingspan of 8m. The Transition vehicle is part-sedan, part-private jet and is due to go on sale as early as 2015, although it may be released in 2016. It has been in development for seven years and during flight testing in 2012, it successfully flew for eight minutes. 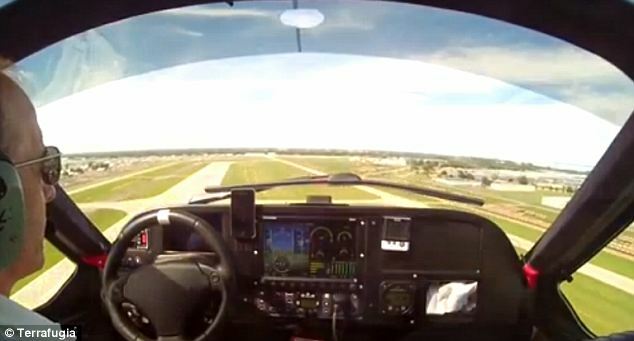 The vehicle was then driven around the EAA AirVenture Oshkosh air show in July before transitioning into the jet and taking off on two 20-minute flight demonstrations. 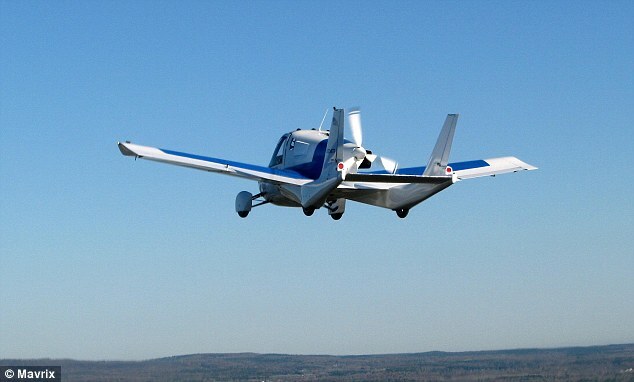 The Terrafugia has two seats, four wheels and wings that fold up so it can be driven like a car. It can carry two people, including the pilot, plus luggage and runs on unleaded petrol. In a statement, the company said: ‘Developing a practical vehicle that simultaneously satisfies road and aircraft regulations to become a true ‘flying car’ presents significant engineering challenges. ‘Yet this is what the team at Terrafugia has achieved with their proof-of-concept vehicle, which has been flying and driving for the past 2 years. Terrafugia has already pushed back the launch once. In 2012, the company said it would have to delay deliveries due to design challenges and problems with parts suppliers. 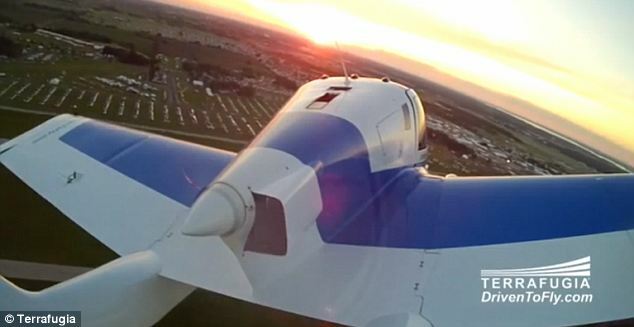 Transition is considered to be a light sports plane by the U.S Federal Aviation Administration, as well as being a road car. Owners will have to have pilot’s licenses, and will need to pass a test, plus complete 20 hours of flying time to be able to fly the car. 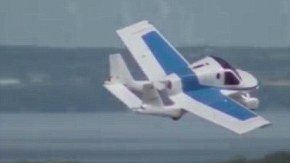 Despite the advances in technology the Transition demonstrates, critics have said that it is still not the vision of flying cars seen in many sci-fi films. To answer these critics, Terrafugia also released designs for a TF-X Model of its Transition range in May last year. The TF-X model will be small enough to fit in a garage and won’t need a runway to take off. Whereas the Transition requires a runway, the TF-X can take off from a vertical position because of motorised rotors on the wings. These rotors will work in a similar way to helicopter rotors. Although you will still need at least 100 ft in diameter in order to open the wings. According to Terrafugia, the vehicle will carry four people ‘in car-like comfort’. It is expected to be able to fly, nonstop, for 500 miles. The TF-X model has not been tested yet, and prices haven’t been announced. 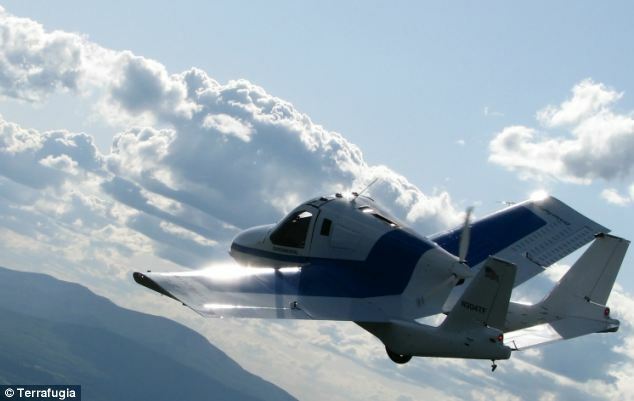 Terrafugia hopes to have working models of the TF-X available for sale within eight to 12 years. Like with the Transition, pilots will need 20 hours of flying and a pilot’s licence to drive it, though. The flying car has always had a special place in the American imagination. Inventors have been trying to make them since the 1930s, according to Robert Mann, an airline industry analyst who owns R.W. Mann & Co. in Port Washington, New York. But Mann thinks Terrafugia has come closer than anyone to making the flying cars a reality. The government has already granted the company’s request to use special tyres and glass that are lighter than normal automotive ones, to make it easier for the vehicle to fly. The government has also temporarily exempted the Transition from the requirement to equip vehicles with electronic stability control, which would add about six pounds to the vehicle. 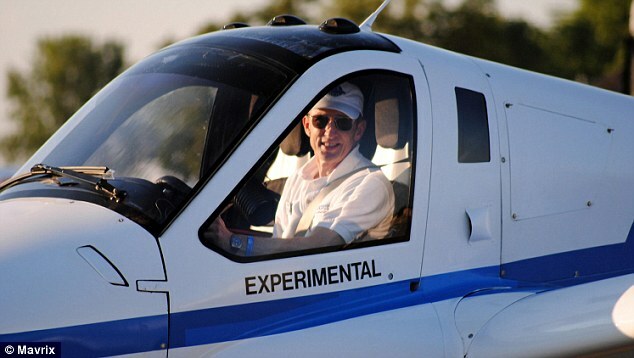 Mann said Terrafugia was helped by the Federal Aviation Administration’s decision five years ago to create a separate set of standards for light sport aircraft. The standards govern the size and speed of the plane and licensing requirements for pilots, which are less restrictive than requirements for pilots of larger planes. ‘This is not going to be an inexpensive aircraft to produce or market,’ he said. Mann sees the western US as the most likely market, where people could fly instead of driving long distances.